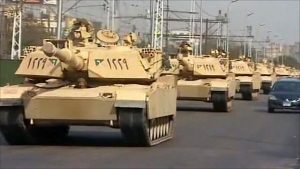 The Egyptian army has announced an impressive deployment of national forces in Northern and Eastern Sinai as the three-month deadline given by President al-Sisi is nearing. “The law enforcement forces began this morning implementing the comprehensive confrontation against the terrorist and criminal elements and organizations in northern and central Sinai,” an army spokesperson said in a televised statement. The operation would be focused on crossing points with neighboring countries, he said. In November, President al-Sisi gave the army three months to end insurgency in the Sinai Peninsula where the Islamic State group (IS) and other like-mind groups have been waging insurgency. Al-Sisi’s stern instructions came following the cruelest attack ever perpetrated in the country. Over 300 people were killed in November in a mosque by alleged ISIS gunmen. The President allowed the army to use brute force in its move to end the insurgency. Al-Sisi also in January extended for three months the state of emergency to help tackle “the dangers and funding of terrorism”. The army’s announcement according to Middle East Eye (MEE) coincides with the ministry of health instructions requesting that hospitals across Ismailia take a series of emergency measures, including doubling the number of doctors on shifts and ensuring that extra medication and blood bags are available. The ministry in a 10-point letter also told hospitals to empty 30 percent of beds in intensive care and orthopedics wards and cancel all holidays for all staff including doctors, nurses, pharmacists and technicians, MEE revealed. The New York Times revealed recently that Egypt received Israel’s assistance in weeding out terror groups in the Sinai. According to the US paper, Israel has deployed unmarked helicopters, drones and jets to pound terror groups’ positions, following the downing of a Russian passenger jet in October 2015. President al-Sisi has green-lighted the operation which the media said garnered some successes with the terrorist shifting to softer targets such as churches and mosques. Cairo has however denied the involvement of Israel in the counter-terrorism operations in the Sinai. Written by: KanelkaTagba on February 9, 2018. Posted by KanelkaTagba on Feb 9 2018. Filed under Headlines, World News. You can follow any responses to this entry through the RSS 2.0. Both comments and pings are currently closed.